Dexter Daily: Today's the Day - Dexter at Comic-Con 2012! Today's the Day - Dexter at Comic-Con 2012! Today's the day! Dexter is at Comic-Con 2012! Everything is ready for today's Dexter panel! Michael C. Hall, Jennifer Carpenter, Yvonne Strahovski and the executive producers of the show will be there! If you are at Comic-Con International, send us your photos from the panel or from the Dexter booths, on Twitter (@Dextergrblog) or via e-mail: dexternewsblog@gmail.com, and we'll upload them later today! 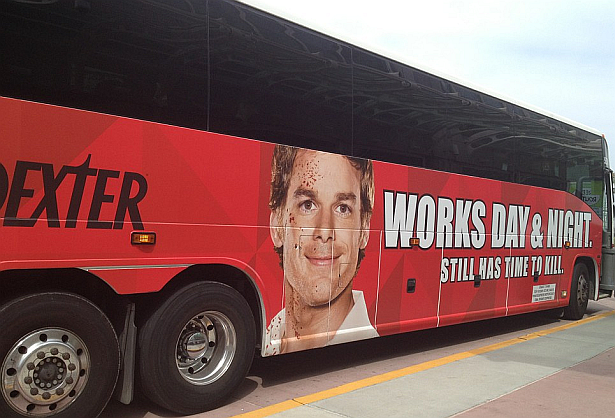 They really put that silly season 2 picture on the bus. Unbelievable. As you may know Dexter season 7 will re-open the case of the Bay Harbor Butcher. So... the photo from season 2 (BHB season) they are using at CC is not random. His wife got killed, his stepdaughter hates him, his girlfriend left him, his sister is about to find out he has been lying to her ever since and a homicide lieutenant just witnessed him commit a murder. And Dex is just smiling? haaha stop acting like cry babies. the picture is more than appropriate. i've yet to find a promo picture of the entire show that is this memorable. it sums the whole show up, dexter has always been a combination of dark comedy and drama. always. Not only that, but why would fans concern themselves with bus billboards, flyers, and other comic con promo materials? I never even think about stuff like that - who cares? It proves that people enjoy bitching WAY TOO EFFING much. Of all the moronic hand wringing I have encountered this past season, this bit takes the cake. would you rather have a pretentious dull picture up there? tough crowd, nothing pleases ya. maybe if he were looking all desperate holding a bloody knife? literal enough? Maybe something like in the Truth Brings Light teaser. A smiling Dex just doesn't catch the mood of this season. Patrick Bateman used "Roar" It's very effective.